Casablanca Beloved – Magic. Beauty. Grace. There’s nothing in the world more rewarding for us than a bride’s honest smile when she finds the one – the perfect wedding gown that will make her feel truly spectacular as she walks down the aisle on her Big Day. That’s what we love most about what we do. That’s what we constantly strive for, and that’s why we always bring in the best collections. And Casablanca Beloved is, without a doubt, one of the most amazing collections we carry in our store. What are some of the things you should know about this brand – and why should you consider one of these gowns? · Casablanca Beloved is part of the world-renowned Casablanca family. This collection was created in 2016 to bring together the classic beauty of Casablanca wedding dresses and the fashion forwardness of Amare Couture (another brand name under Casablanca Bridal). Beloved encompasses the best of both worlds: romantic touches and modern vision. · Casablanca Bridal has its own state-of-the-art manufacturing facility which allows it to directly oversee the quality of every gown they make. · Savvi brides love Casablanca gowns because they are completely customizable, and the gown is made according to your height; making this designer one of a kind at an incredibly attractive price. Plus, you’ll save on hemming your gown. Your gown will be unique - like no other girl in the world. · Every wedding gown created for the Casablanca Beloved line is meant to embrace a woman’s body in a graceful, flattering way. There’s something utterly sensitive and sweet in every seam, every detail, every inch of fabric of these dresses. There’s something romantic about the way they’re brought together in a way that surpasses most women’s expectations. · The designs, the fabrics, the colors, the details – they are all meant to make your wedding look resonate with the emotions you’re experiencing on your wedding day. They enable you to show the positive vibes you’re experiencing inside and project them outward to the world – to your wedding guests eagerly waiting for your big entrance, and to your very own beloved, the one you have chosen to share your life with. · Casablanca Beloved is all about honesty and innocence, power and love, all combined into wedding gown designs that leave people speechless. If you’re looking for something that will not only embrace your body, but also your soul, Casablanca Beloved is precisely what you are looking for! Want to learn more about Casablanca Bridal, Casablanca Beloved, or any of the other gorgeous brand names we hold in our store at Savvi NC? Contact us and schedule an appointment – no matter what your style is, we’ll help you find your perfect dress from our wide array of options! Have You Ever Considered Changing Your Hairstyle for the Wedding Reception? As the bride, you want to look nothing less than stunning as you walk down the aisle, as you dance your first dance, and all throughout the Big Day, until you bid your guests farewell. Obviously, your wedding dress matters A LOT when it comes to the way you feel and how you look on your wedding day. But the way you accessorize the dress, the makeup and the hair matter a lot too. So, if you can change your dress for the wedding reception, why wouldn’t you change one of the complementary elements of it too – such as your hairstyle, for example? How to do it? We have some tips for you – so read on and find out more. · Let your hair down. Did you wear your hair in a bun for the wedding ceremony? The simplest way to change your hairstyle for the big party is to simply let it down. It takes about five minutes to pull out the bobby pins holding the bun, to re-arrange the hair a bit and maybe add one or two cute accessories that go with your reception wedding dress. That’s it – you’re ready to party! · Let the braid down. Not sure about leaving your hair completely down for the reception? How about wearing it in one (or more) braid(s) pulled up during the wedding ceremony and leaving the braid down for the reception? This casual, carefree style is bound to suit any bride, and it works with a variety of wedding gown necklines too – so you will definitely love it! · Just change the accessories. If you wore really elegant bridal hair accessories for the ceremony, why not switch it up a bit for the wedding reception and change your hairstyle just a little, by using different accessories? Switching from pearl accessories to flowers or a flower crown can change your entire look, just enough to complement your reception appearance! · Pull it up. You can always wear your hair down in gorgeous angelic curls for the ceremony and then rapidly pull it up in a slightly messy bun for the wedding reception. Doing this will give you plenty of freedom to move around (and dance, of course). 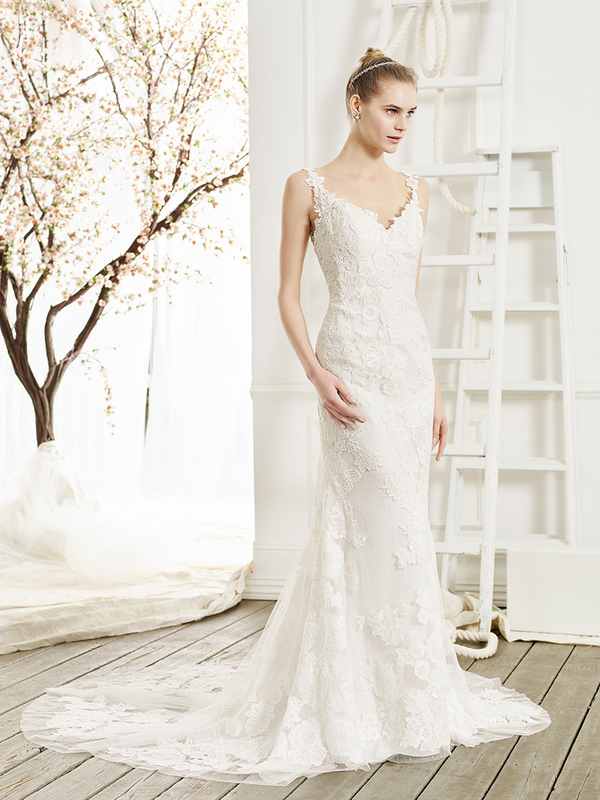 Looking for the perfect wedding dress in North Carolina? Contact Savvi NC right now and come visit our boutique to find your very own the one – the dress that will complement you in every aspect there is!